VBP & Thankful Thursday: New Boxes! Today, I am emulating (VBP) Savannah’s post last week: I am posting our VBP post and I am pawticipating in the Thankful Thursday blog hop! Killing two birds with one stone (VBP) click. I have good news for all my furriends who were concerned about my welfare because the humans had killed the boxes. We I got brand new ones! And guess who was determined (VBP) to play with my tail? So, what are we thankful for, this week? Me, for my boxes. Kitshka, for my tail. 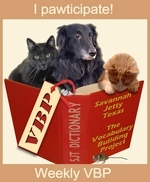 Jet, Savvy and I, for your pawticipation in our blog hop. Here are this past week’s pawticipants. You will find the little blue badge to enter the linkie to your post for next week at the end of the post. Thank you & Happy VBP! Look how organized us kitties can be? Doesn’t it look great? Wouldn’t you want to be as organized as us? Have you entered our giveaway to win one of two beautiful kitty calendars designed by Bernadette from The Creative Cat? No?! Then click on the picture below to enter now. You have until tonight, 9 pm EST. P.S.S. : we are late visiting your bloggies again. We hope to resume tonight or tomorrow. 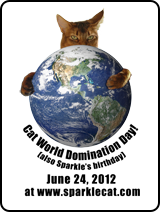 Sorry furriends.